INDUSTRY.co.id - Solo - General Chair of GAPKI (Indonesian Palm Oil Entrepreneurs Association) Joko Supriyono expressed his gratitude to the ranks of the press throughout Indonesia. Positive press support will strengthen Indonesia's position as the world's largest palm oil producer and exporter. 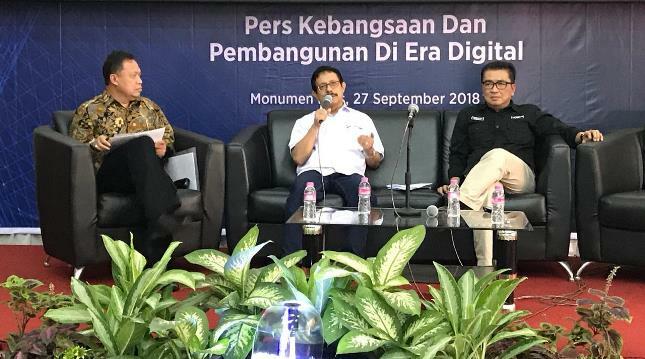 "The press of the Indonesian press on oil palm issues has been very positive and objective," said Joko Supriyono when speaking at the National Workshop on "National Press and Development in the Digital Age" at the Solo Press Monument on Thursday (09/27/2018). Joko said, as a strategic industry the press should support the existence of the palm oil sector. Especially amid the weakening of the rupiah exchange rate and the trade balance deficit, palm oil exports can become a national economic saver. "This is not just the interests of entrepreneurs or industry, but it concerns nationalism as a nation," said Joko. At the meeting to welcome the XXIV Congress of PWI (Indonesian Journalists Association), Joko compared national media coverage with Western media which incidentally were producers of palm oil competitors. "We believe foreign media coverage that discredits oil palm does not stand alone. But part of the interests of developed countries to defeat palm oil in the competition of global vegetable oil," said Joko. Joko said, in 2017, palm oil exports contributed to foreign exchange of USD 22.9 billion or more than IDR 300 trillion. There are 17 million Indonesians living from the oil palm sector both as workers and oil palm farmers. Joko said GAPKI representing oil palm plantation companies in Indonesia will continue to strengthen cooperation with press institutions in Indonesia. So that the positive perception of palm oil is increasingly widespread among the public including netizens.